Erma Bombeck said, “Car designers are just going to have to come up with an automobile that outlasts the payment.” Hyundai is the renowned automobile brand which is working on this notion and keeps on introducing new cars for every segment so that all users can enjoy the drive according to their needs and level of affordability. 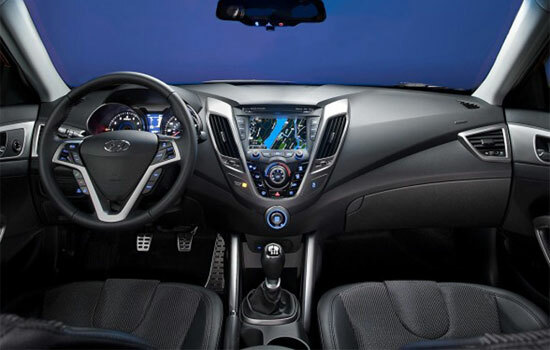 2012 Hyundai Veloster is among the trendy and stylish cars of Hyundai that was launches on 10th of January 2011; in it Hyundai has integrated many entertainment and connectivity features and Blue Link in one of the prominent feature. Hyundai has equipped Veloster with 1.6L GDI Gamma engine which is coupled with 6-Speed manual transmission and first double clutch transmission of Hyundai. 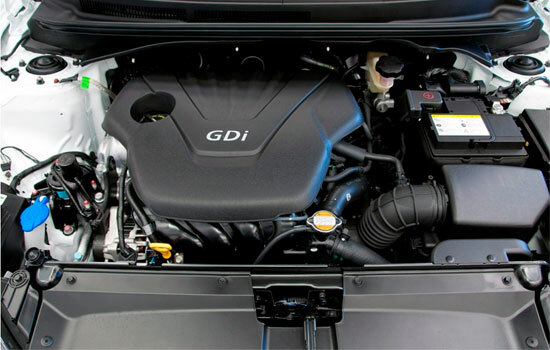 John Juriga, Hyundai American Technical Center Inc. (HATCI) powertrain director said, “Gasoline-direct-injection technology allowed Hyundai engineers to create an engine that is powerful, fuel-efficient, and has fewer emissions. Despite its small size, it generates some big numbers, with both impressive horsepower output and up to 40 mpg on the highway.” Fuel efficiency of 2012 Hyundai Veloster is greater than the Honda CR-Z Hybrid. Design of Veloster is inspired from the performance oriented sports bike; it features unique A-pillar which provides glass a motorcycle helmet screen looks. Hexagonal t grille which is the Hyundai signature feature is situated on the front in addition to hood scoop detailing and LED position lights. 2012 Veloster is the blend of style of coupe and functionality of hatch back. 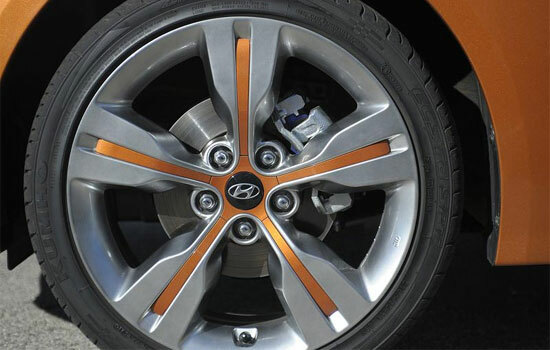 17 inches wheel are available as standard feature in 2012 Hyundai Veloster. 2011 Hyundai Veloster is quite versatile car and equipped with trendy interior features. Its interior volume is superb i.e. 105.3 cubic feet which makes it vehicle with more cargo space as compare to 2011 Honda CR-Z, Scion tC, Mini Clubman and Hardtop. 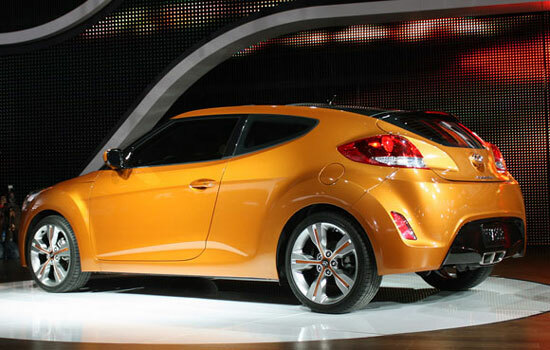 2011 Hyundai Veloster features wheel base of 104.3 inches, length of 166.1 inches and width of 70.5 inches. 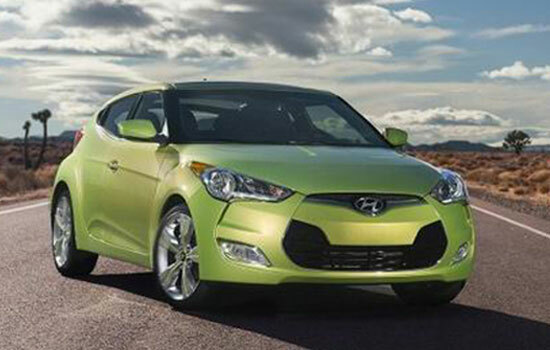 Hyundai has equipped 2012 Hyundai Veloster with state-of-the-art safety features. For instance it features Vehicle Stability Management System which efficiently manages the Electronic Stability Control and MDPS (Motor-Driven Electric Power Steering). To provide maximum safety to passenger in case of crash or collision Veloster consists of 6 air bags i.e. double front, front side curtain airbag, back side curtain airbag, and front seat mounted side impact airbag. 2012 Hyundai Veloster offers latest braking package to its customers which consists of 4-wheel disc brakes, ABS including brake assist that offers utmost braking force when a sudden stop is noticed. Depending upon the loading condition of vehicle, Electronic Brakes Distribution automatically balances the braking force to front and back axles. 2012 Hyundai Veloster has every thing that you expects from any Hyundai Vehicle. Hopefully you will not be disappointed after purchasing this macho car from the house of Hyundai.